An increasingly larger percentage of the general population are reporting problems caused by gluten ingestion, whether it is due to celiac disease or gluten intolerance. What is the cause of this? Experts believe that human modification to wheat has made it better, more robust crop. However, could this modification to the wheat crop be accountable for the rise in celiac disease and gluten intolerance? Until about a decade ago, celiac disease was believed to be quite rare, affecting one per several thousand people. Currently, the number of people with it has expanded to at least 1% in most geographic areas (De Lorgeril & Salen, 2014). In Northern Africa, almost 6% of the population is said to suffer from celiac disease (Sapone et al., 2012). This increase could be due to better diagnostic testing but consensus is that the incidence of the disease itself has increased. The recent increase in the market for gluten-free products in North America largely exceeds the foreseeable consumption of the celiac disease patient population. This suggests that an undefined proportion of the general population consider themselves to be suffering from problems caused by wheat and/or gluten ingestion, even if they do not have CD. it is apparent that that we have adopted the tendency to rely on self-diagnosis (“hypersensitivity to wheat and gluten”) and subsequent therapy (eliminating gluten) far more readily than the medical/scientific community. This can be seen by a 4598:1 ratio of Google to PubMed citations for the keywords “non-celiac gluten sensitivity,” as well as several papers expressing clear skepticism or simple caution (Di Sabatino & Corazza, 2012). With evidence that celiac disease is increasing and more of the general public are reporting intolerance to gluten, it is indicated to look for explanations for this phenomenon. One theory addressing the increase in gluten intolerence regards the change in gluten-rich products themselves throughout time. The two subsequent World Wars caused a food shortage in the first half of the 20th century. This, along with an exponential growth in the world’s population, it was of many agronomists and geneticists best interests to create new varieties of wheat that were stronger and richer in gluten. Changing Wheat = Gluten Intolerance? Can we infer from this that the structural differences between modern and ancient grains account for the population wide increase in celiac and gluten intolerance? Not necessarily. However, this question does have major implications, as dramatic changes in the epidemiology of celiac disease and outbreaks of new gluten intolerance syndromes have taken place during the same period of time in which thousands of new wheat hybrids were introduced into human foods. With the structural changes of modern wheat, there is a potential that celiac-triggering gluten proteins are expressed to higher levels in modern wheat. For the moment, however, scientific evidence is lacking that this is indeed the case. This is a critical issue and more clinical studies are urgently needed. 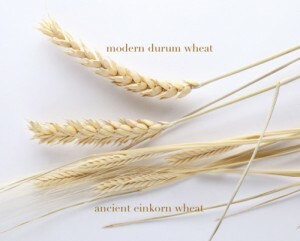 We do know for a fact that the wheat structures has changed and it is true that the bread we eat today is definitively not the bread that our grandparents ate. There has been an increase in celiac disease among the population, but this is not the sole reason for the larger demand for gluten-free products. As a population, we have developed an increased tendency to rely on self-diagnosis and eliminate gluten from their diets. Modern agriculture has caused for structural and biological changes to occur in wheat through hybridization techniques, which possibly could account for the increased prevalence of intolerance to gluten, however there are other factors to consider. For the moment, scientific evidence is lacking that this is indeed the case and this still remains a theory. Di Sabatino, A., Corazza, G.R. (2012) Nonceliac gluten sensitivity: sense or sensibility? Ann Intern Med, 156, 309–311. Sapone, A., Bai, J., Ciacci, C., Dolinsek, J., Green, P., Hadjivassiliou, M., Fassano, A., et al. (2012).Spectrum of gluten-related disorders: consensus on new nomenclature and classification. BMC Medicine, 10(13). Song, X., Ni, Z., Yao, Y., Zhang, Y., Sun, Q. (2009). Identification of differentially expressed proteins between hybrid and parents in wheat (Triticum aestivum L.) seedling leaves. Theor Appl Genet, 118, 213–225. Previous Canada’s Food Guide – Harmful or Helpful?